This is part 2 of Making Yogurt for Dirt Cheap. First of all, I forgot to mention in yesterday's post on freezing starter, how to thaw starter for use. Thaw only what you need for one batch. on counter for 3 to 4 hours. Don't thaw with heat (microwave or stove). My unplanned, unorganized method -- when I first get up, I take one 6-oz container of starter from the freezer and leave on the counter. By the time I'm ready to use it, it's thawed completely. Now, on to making your own Greek-style yogurt. Greek yogurt appears to be one of the new super foods. It's packed with nutrients. Lots of active cultures, heaps of protein, and less sodium and carbohydrates than traditional yogurt. It makes a good substitute for mayo, sour cream and cream cheese in sandwich and cracker spreads, and dips. Plus, it's lower in lactose than traditional yogurt, which is already a reduced lactose product. The process of making yogurt lowers the lactose in milk, plus straining out additional whey removes even more. For me, Greek yogurt is one of just a couple of dairy products that I can eat. But, Greek yogurt in the store is a tad expensive for what you're really getting. It's just plain yogurt, which has been strained to remove whey. Nothing complicated about it. I use homemade yogurt to make Greek-style. You can also turn commercial, plain yogurt into Greek-style, too. It's simple, requires minimal hands-on time, and can save you a buck or two on your Greek yogurt fix. Take a mesh sieve and place over a bowl. 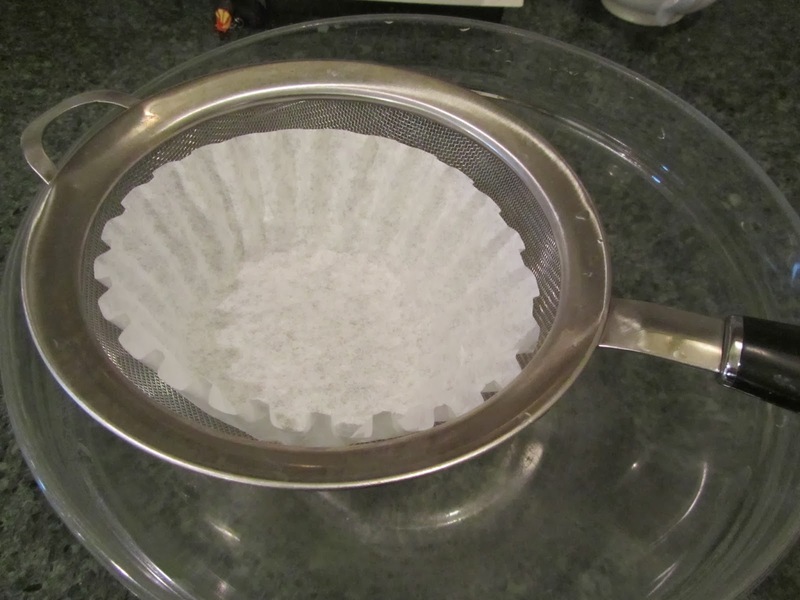 Line with a paper coffee filter, or several layers of cheesecloth. Spoon plain yogurt into filter. (I can fit about 3 cups of yogurt into my sieve at a time.) Place in the fridge, and wait. Out of 3 cups of yogurt, 1/2 cup of whey drains off in about 1 hour. We're satisfied with a final product that has about 1/3 (1 cup) of the water/whey removed, which takes about 3 hours. When the desired consistency is reached, scoop into a container, cover and refrigerate. That's it. Greek yogurt keeps for a couple of weeks. 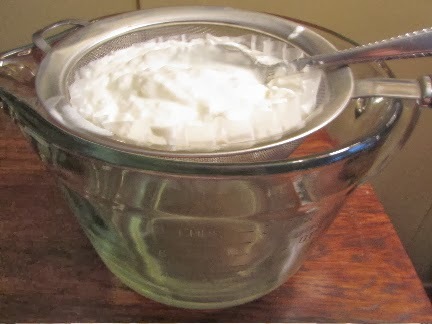 My homemade, Greek-style yogurt costs about 80 to 85 cents per quart. Now that's dirt cheap for Greek-style yogurt. You can save the whey to use as liquid in quick breads or muffins. Whey is nutritious in its own right. It contains protein, calcium, potassium and Vit B-2. You could pour the whey down the drain, but why not use it as a nutritional boost to the foods you cook?! I've been meaning to try this. I don't use full-fat milk to make yogurt, and despite adding some skim milk powder, it often turns out thin. So this would do the trick! Oh this is so easy to do. It would definitely thicken up your yogurt. I use this when I make soy yogurt, as that comes out thin, as well. I don't know what cooking method you use to make your yogurt, but I heat my milk in a large pot on the stove, uncovered, and on LOW, for a couple of hours, before bringing up the temp to MED. (I can just leave the pot on LOW, and come back every 10 minutes or so and give it a stir), I do this to create as much evaporation as possible with the milk, and have a denser product. Out of 1 gallon, about 2 cups of water evaporates. I experimented with heating the milk in the microwave to save time, but my yogurt came out thinner, as a result. My guess is from significantly less evaporation of water. Anyway, straining it would give you a much thicker product. And it's so easy to do. I don't usually buy yogurt but, this year, I've started drinking green smoothies & plain Greek yogurt is a great protein source. I paid $5 for a quart of Chobani Greek yogurt last week. I've been combing the internet looking for a good recipe but I'm a little (lot) intimidated. After seeing your cost for homemade, I'm really motivated because I'll save so much! Wow! $5 a quart. If you bought plain yogurt and strained it yourself, you'd be saving at least $1 per quart, maybe more, depending on sales on plain yogurt quarts in your stores. Straining yogurt takes about 5 minutes of hands-on time, so doing the straining yourself will net you at least $12/hour of savings. And that's not even making yogurt from scratch, that's using store-bought plain yogurt. It's an easy compromise which can still save you significant money over time. How do you use whey in baking and cooking? I use the whey in place of some of the liquid in muffins, quick breads and pancakes. Some people use it in soups, as well. When I have more whey than I can use in a week, I freeze it in 1 cup containers. Then I can use it later, when my family is in the mood for pancakes or the like. 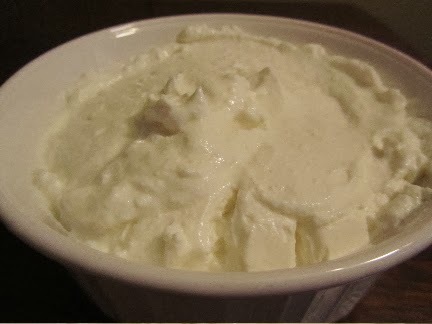 Yum, I love Greek style yogurt and you're right, Lili, it is easy to make at home and so much cheaper than store bought. 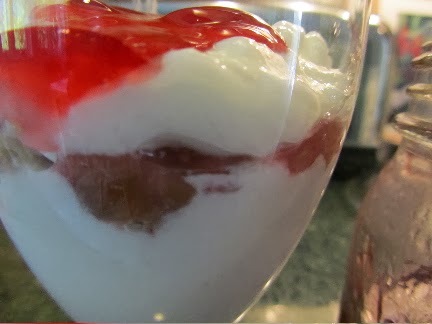 I love to stir in some of my home made preserves for either a peach or strawberry flavored yogurt. You can flavor it up all kinds of ways. Peach preserves in yogurt sounds so yummy! I'd love to live somewhere that peaches could be grown easily! It's ridiculously easy! The hard part is keeping the rest of the family from eating it all before I get to it!